A small brown bottle of liquid sits on the table, positioned between the two men. The glass has no label, but both the patient and the doctor know what it holds. The sick man calls it “control” and the urologist calls it “medication” , but the non-prescription substance has another name. 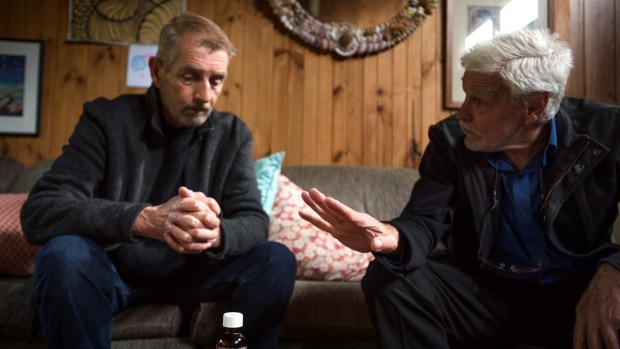 He has come to meet with Dr Rodney Syme, 79, the controversial vicepresident of Dying with Dignity Victoria , to discuss the final stage of his life and his control over how those minutes unfold. Catastrophic events such as a heart attack, pulmonary arrest, embolism or severe bleeding are a risk. Liver failure and jaundice are a concern and, as the cancer spreads, cachexia or “wasting” . Godbold spent 34 years as a nurse. As a midwife, he has been in the delivery room for the arrival of so many newborns, and he has also been present in homes and hospices as countless others have died in his specialist palliative care. The two men shake hands and begin discussing the efficacy of what is, in effect, a black market substance . Nembutal is a “border controlled drug” , possession of which is a breach of law. Penalties range from imprisonment to fines of up to $825,000. Paul Russell, director of HOPE, an organisation devoted to preventing euthanasia and assisted suicide, said it was “frustrating” that any doctor would supply patients with lifeending medication. “Euthanasia is never safe,” he says. The story of Ray Godbold creates an “impetus for change” , he says, but equally there are other stories that should create “cause for pause or thought” . In Victoria, it is a criminal offence to incite, aid or abet a suicide, with a maximum penalty of five years’ jail, yet no Victorian doctor has been charged with assisting suicide in the past 50 years.